Sweden's Wolf returns with another solid disc of heavy metal in its most classic form. My first appreciation of Wolf came with 2006's 'The Black Flame.' Prior to this work, I considered them second rate NWOBM wannabe, only a rougher and more redundant. Though 'Ravenous' is not going to blow your doors of with innovation, it proves that Wolf has found their groove and knows their craft very well. Again, Wolf treads the time honored and classic road of 'true' heavy metal combining epic riffage and blistering fret work undergirded by a solid rhythm section. The compositions vary between heavy steady tempos as on 'Curse You Salem' or 'Love At First Bite' to the more galloping on 'Speed On' or 'Whiskey Psycho Hellion' (now there's a metal title!). There's little movement beyond this except for a few tricky arrangements on 'Mr. Twisted' and 'Hiding In Shadows.' But this is not progressive metal, and since I would never think of coming to Wolf except to bang my head, this cool by me. Unfortunately, even when done will, repetition can lead to monotony. Quite easily, the middle of the album, from 'Ravenous' to 'Love At First Bite,' could be dismissed as less memorable than the beginning or end. However, in the end, it's all solid melodic heavy metal, and very well done. 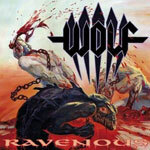 Wolf is doing what they do best on their fifth release 'Ravenous,' delivering powerful and raw classic heavy metal. 'Ravenous' is all leather and whiskey head banging metal with heavy riffs, a steady and rolling rhythm section, and flame spitting fret work from start to finish. In other words, Wolf is keepin' it true. Exactly what I expect.